Torre Mar supports a number of local organizations and programs as part of our social responsibility program. Galapagos is a world heritage site. What many people don’t realize is there are also communities in the Galapagos Islands. The residents of Galapagos are the caretakers of this world treasure. At Torre Mar we are engaged in the community and support various community activities that support the important partnership of man and nature. Our staff has participated in many local, national, and international workshops with a focus on Galapagos. Many of the programs we have supported are focused on the youth of the islands. In addition, we have hosted educational workshops. 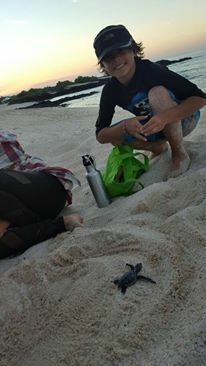 It is very important the children growing up in Galapagos learn stewardship of the environment now. Investing in our youth will grow the future leaders and caretakers of the Galapagos Islands. We have also gone a step further and hosted international education programs. We feel the global community can learn from the wealth of environmental knowledge found in Galapagos and be engaged to support the protection of this very special world treasure.